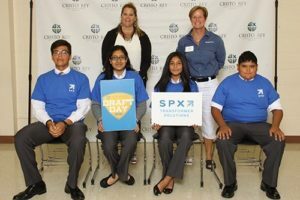 On August 16, 2016, human resources representatives from SPX Transformer Solutions sat in a crowded Cristo Rey Jesuit High School gymnasium in West Milwaukee, Wisconsin waiting to announce their “draft selections” for the 2016-17 school year. In September, four students started an assignment that has them each working in the Waukesha, Wisconsin Human Resources office one day a week and every fourth Monday. Cristo Rey follows a unique, nationally successful work study model enabling each student to earn a portion of their educational costs by working entry-level positions at area companies. Cristo Rey Jesuit High School opened its doors in West Milwaukee to its first class in July 2015 and is part of a nationwide network of 32 Catholic, college preparatory high schools for students from limited financial means. All Cristo Rey schools share a unique and innovative model which empowers students to pursue higher education through a rigorous curriculum and provides invaluable professional work experience through the Corporate Work Study Program, which helps them make informed decisions about their abilities and their future. In its inaugural year, 23 local businesses participated in the Milwaukee program. This year, that number more than doubled to a total of 50 employers. Exploratory teams reached out to SPX Transformer Solutions in 2013 while evaluating Milwaukee as a potential site for a Cristo Rey school, inquiring if we would support a work study program for high school students. When the school held its debut orientation and “Draft Day” in 2015, officials were still gaining support from suburban companies so most students were placed with employers in downtown Milwaukee. When Julie Geyer, HR director at SPX Transformer Solutions, was approached for the 2016–17 school year, the company enthusiastically accepted the invitation to participate. “SPX Transformer Solutions is the beneficiary of the student workers’ productivity and contributions, and, in turn, the company provides job coaching and mentoring that allows us all to play a part in developing the talent pool for Milwaukee’s future,” said Geyer. To learn more about Cristo Rey, visit www.cristoreymilwaukee.org.